Inventiveness, boldness and a clear sense of the wishes of customers and consumers – these are the principal foundations that the tesa® brand has built upon in the course of its more than 75-year history. From the classic tesafilm® a brand family has developed with more than 7,000 innovative and customer-oriented products – for the industrial and commercial segments, and end consumers. As one of the leading international manufacturers of self-adhesive products and system solutions, and an independent public limited company in Europe, we are represented in over 100 countries and are the global market leader in numerous fields of application. 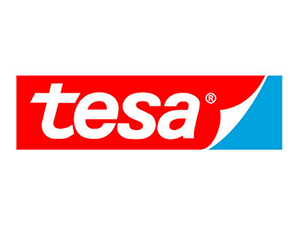 The successful story of tesa began with the launch of tesa® adhesive tape in 1936 (from 1941 tesafilm®) and the tape dispenser that followed shortly after. Over the course of time, a brand family developed that now embraces over 300 products for end consumers. Intelligent tesa solutions in ten segments make life easier for consumers across Europe – in schools, offices, in the home and in the do-it-yourself segment. Many of these are now classics; not only tesafilm® with its dispenser, but also products such as tesa® masking tape, tesamoll®, tesapack® or tesa Powerstrips®. The more than 75-year brand history of tesa is rooted in a wealth of experience in the development, manufacturing and marketing of self-adhesive tapes. Thanks to continuous research work, we now occupy a world-leading technological position in many fields. Around 220 scientists and developers in laboratories in Germany, the USA, China and Singapore are responsible for a never-ending stream of innovations with which we can fulfil the needs of our customers and consumers. What’s more, our scientists also ensure the continuing improvement of the existing range of classic products. The most recent examples are tesa Powerstrips® Waterproof and the new Powerbond® Ultra Strong – with a retention strength of up to 100 kilograms per meter, this is the strongest tesa® mounting tape ever made. tesa Powerstrips® Waterproof were specially developed for use in damp environments. Thanks to the patented Powerstrips® technology, they can later be removed without a trace. An important element of our successful brand and corporate history is the close cooperation and exchange with our trading partners and consumers. Insight into the individual needs of our customers is the foundation on which our ideas and our success are built. We provide support for the growth of our partners not only with a high-quality, innovative product portfolio at competitive prices, but also with effective marketing measures. Satisfied customers in numerous countries bear witness to our mutual success. The interaction of optimum product benefits, highest quality and reliability is an intrinsic element of the tesa philosophy. Focusing on our customers and their needs enables us to seamlessly pursue the realisation of all product requirements. All tesa facilities around the globe are certified in accordance with internationally recognised ISO 9001 quality management systems. In addition to this, carefully selected raw materials and regular auditing of suppliers ensure that our quality is maintained at a consistently high level. At tesa, financial success, environmental protection and ethical behaviour are equally essential corporate objectives and an active continuation of our tradition. The development of environmentally compatible production technologies is also a part of this. Today, we already manufacture the majority of our products without the use of solvents. We are also continuing our commitment to sustainability at product level. We use the tesa ecoLogo® sub-brand for particularly eco-friendly solutions made from recycled materials and renewable resources – our ecoLogo® products. tesa® Stick, tesafilm® eco & clear, the tesa Easy Cut® hand dispenser, the refillable tesa® sticky and correction tape rollers, the new tesafilm mini tape dispenser ecoLogo® and the tesa mini correction tape roller ecoLogo® have been making homes and offices greener since the start of 2010. Following the successful launch in the office supply segment, tesa is consistently expanding the product range. With tesa® Eco Premium masking tape, the double-sided adhesive tape tesa® Eco Fixation, tesa® extra Power Eco Repair cloth tape as well as tesapack® eco & strong, which is already established in the office supply segment, especially eco-friendly adhesive tape solutions are making their way into building supply and DIY stores – for masking, affixing and repairing. Thanks to solvent-free production and the use of primarily organically derived or recycled materials and packaging, these products do their part in protecting the environment. Furthermore, our product portfolio embraces various products with which consumers can make their own contribution to environmental protection – for instance, saving energy by draughtproofing doors and windows with tesamoll®.